Following a collapse in oil price in the late nineties, which made many of the UK oil/gas fields potentially uneconomic, a senior level joint industry/Government group was formed – the Oil & Gas Industry Task Force (Now called PILOT). In 1999, this group realised that an independent industry organisation was needed in order to dramatically improve efficiency in the key areas of Supply Chain and pan-industry collaboration. This body became LOGIC and with initial funding from the DTI and five Trade Associations, started work in early 2000. Nearly four years later many will ask Where is LOGIC now? – What has it done? – What are the lessons learnt? – Is there anything transferable to other industry sectors, etc.? This article will try and answer some of these questions. The original plan for LOGIC was to be self-financing after 3 years, at the end of the initial DTI/Trade Association funding phase. LOGIC is now operating as a commercial organisation with an annual turnover of some £1.5m pa, with 17 staff members. The company is responsible for developing and administering a host of pan-industry services and has become the Oil and Gas Industry “centre of excellence” for supply-chain effectiveness. LOGIC is currently expanding the provision of its consultancy services and is preparing for an exciting future as a growing and successful organisation. LOGIC has successfully facilitated and implemented many pan-industry collaborative solutions to improve the efficiency of the Upstream Oil & Gas industry. These include co-operative solutions to improve logistics (i.e. supply boats & helicopters), the development of a new web-based system to track offshore personnel movements, the development of standard contracts for a range of services and systems to improve asset transfer procedure. LOGIC has also been invited to manage and facilitate the activities of many specific pan-industry groups. 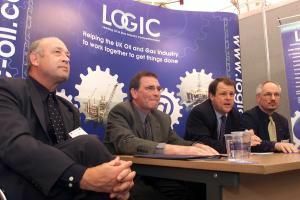 LOGIC believes that as the UK Continental Shelf continues to mature and as the players in the Industry continue to change, pan-industry collaboration will become more and more critical in the future. Finally, most of LOGIC’s tools, experience and services are directly transferable to many other industry sectors. LOGIC has already had discussions with the power generation, renewable and nuclear sectors and through an involvement with the DTI/CBI “Fit for the Future” campaign (www.fitforthefuture.org.uk), LOGIC believes that it can help improve collaboration, supply-chain effectiveness and the successful sharing of best practice in other sectors of UK industry. And what of the future? Increased pan-industry co-operation is essential to maximise oil and gas recovery and to enhance the competitiveness of the UK Supply Chain. LOGIC has the proven track record and it is in a unique position to help. LOGIC can be contacted at www.logic-oil.com.